At this point of the stairway leading up to Casa Loma and Spadina House you have climbed about 100 steps but there are only a dozen left to go. I thought this was a nice scene to greet you and urge you on to the top. The oak trees were just starting to leaf out when I took this pic a week ago. These trees were neighbours of the one I showed a couple of weeks ago that had been destroyed in the wind storm. A bit of a rest in a pretty spot is always welcomed when climbing stairs. Exercise and great pictures. A good combination. That's a lot of steps to climb up! That a lot of steps. I love seeing the new leafy growth on the trees. 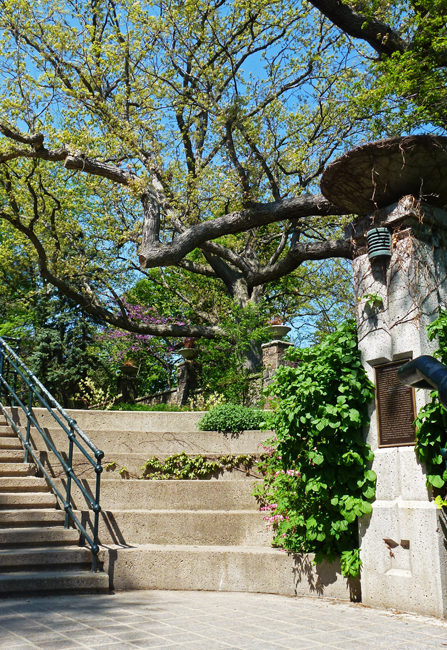 Hello, it looks like a pretty spot to rest before climbing the rest of the steps. Happy Friday, enjoy your weekend! I haven't been there in eons!!! How did the trees climb all the way up there? I would have taken the elevator. I enjoy your adventures! The sights are wonderful!